Looking for the best ways to boost your protein intake? Start by giving your diet a makeover. From turkey and beef to lentils and quinoa, there are plenty of high-protein foods that pack a hefty nutritional punch. They not only taste amazing but also keep you full longer and improve appetite control, making weight loss easier. For good reason, health experts and nutritionists recommend eating foods with lots of protein. This macronutrient is more filling than carbs_, _has fewer calories than fat and stimulates thermogenesis. Basically, it increases your body's core temperature, leading to a faster metabolism and increased fat burning. A 2014 review published in the journal Nutrition & Metabolism explains the underlying mechanisms through which protein helps with weight loss as well as its potential drawbacks. High-protein diets stimulate the production of satiety hormones, reducing hunger and cravings. Furthermore, this nutrient increases energy expenditure and improves body composition, especially in physically active individuals. Whether your goal is to build muscle, lose fat or maintain your figure, a high-protein diet can make everything a lot easier. As the Journal of the Academy of Nutrition and Dietetics points out, protein plays a key role in muscle growth and repair. It also boosts muscle strength, speeds up recovery after exercise and supports athletic performance. Let's take a closer look at the top 10 sources of protein and their potential health benefits. Both chicken and turkey are complete protein sources, so they contain all nine essential amino acids needed for the proper functioning of your body. One serving of skinless raw chicken breast has only 114 calories and boasts a whopping 21.2 grams of protein. Just make sure you remove the skin — otherwise, you'll get an extra 58 calories per serving. Turkey breast is slightly higher in protein. One serving has 125 calories, 26 grams of protein and 1.8 grams of fat. It's also a good source of potassium and iron. Grill, roast, boil or steam these foods to preserve their nutritional value. Fried chicken and turkey are higher in fat and calories, so it's better to avoid this cooking method. According to a 2014 study published in The British Medical Journal, eating fried foods once or twice a week increases the risk of weight gain in people who are genetically predisposed to obesity. One serving of lean ground beef provides 182 calories, 22.6 grams of protein and 9.4 grams of fat. It also boasts 38 percent of the RDA of zinc, 16 percent of the RDA of phosphorus and 26 percent of the RDA of selenium. Beef is one of the best dietary sources of vitamin B6, vitamin B12 and niacin. Lean red meat, including beef, exhibits a high nutritional value and can help with weight loss and weight maintenance, according to a 2015 article featured in Proceedings of the Nutrition Society. Researchers point out that it may increase satiety and promote fat loss when consumed as part of a high-protein diet. Its ability to preserve lean mass and reduce muscle loss shouldn't be overlooked either. Loaded with protein, iron and B-complex vitamins, steak is one of the most nutritious foods out there. Its nutritional value depends on what cut of meat you choose. Sirloin steak, for example, has 26.2 grams of protein, 4.3 grams of fat and 150 calories per serving. It provides 21 percent of the RDA of vitamin B12, 38 percent of the RDA of niacin, 47 percent of the RDA of selenium and 32 percent of the RDA of zinc. Eye of round steak, by comparison, delivers 25.4 grams of protein, 3.3 grams of fat and 139 calories per serving. It's one of the leanest cuts of beef available and goes well with such foods as veggies, wild rice and salad. In addition to protein, beef is an excellent source of CLA. According to Pennsylvania State University, this fatty acid has the ability to kill cancer cells and inhibit tumor growth. It also plays a key role in bone formation, immune function and weight management. Even though most studies have been conducted on animals, the results are promising. In fact, CLA supplements are highly prized in the health and fitness community for their fat burning and performance-enhancing properties. If you're looking for a simple, convenient way to boost your protein intake, you can't go wrong with tuna. It provides 42.1 grams of protein, 1.4 grams of fat and 191 calories per can. That's a lot more protein compared to poultry and beef. Tuna is also one of the best dietary sources of omega-3s, selenium, niacin and vitamin B12. Your body needs omega-3s for the proper functioning of the immune, cardiovascular and endocrine systems. These nutrients also serve as a source of fuel, fight inflammation and protect against heart disease, according to the Office of Dietary Supplements. Despite its health benefits, tuna should be consumed in moderation. Several species, such as bigeye and albacore tuna, are high in mercury and may cause adverse reactions. Muscle weakness, kidney problems, respiratory failure, speech impairment and lack of coordination are just a few of its potential side effects. To stay on the safe side, try not to exceed two servings of canned tuna per week. Salmon is higher in omega-3s and lower in mercury than tuna. One fillet, which is about two servings, has 468 calories, 50 grams of protein and 28 grams of fat. It also boasts 14 percent of the RDA of vitamin C, 10 percent of the RDA of vitamin A and 4.3 percent of the RDA of iron. 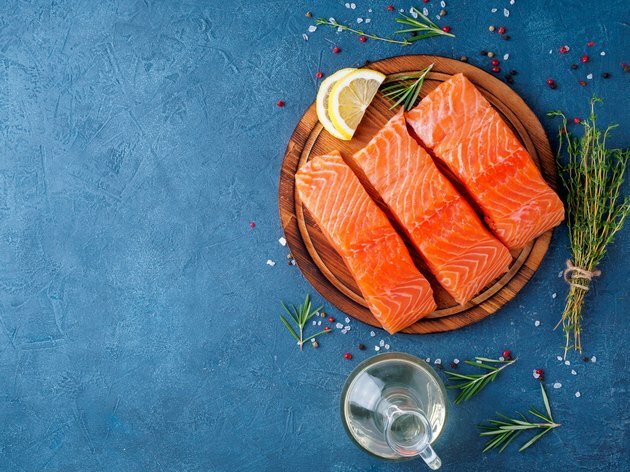 The fats in salmon consist largely of _polyunsaturated fatty acids (PUFAs)_, such as omega-3s and omega-6s. These nutrients may improve brain function and mental health, according to a 2017 review featured in the journal Microbial Ecology in Health and Disease. They regulate gene expression, immune function, inflammatory processes, cellular growth and other biochemical processes. In clinical trials, PUFAs have been shown to enhance cognitive function, ward off depression and protect the brain from oxidative damage. Researchers point out that omega-6s are pro-inflammatory_, while _omega-3s prevent and reduce inflammation. Therefore, it's essential to maintain a balance between the two. Contrary to popular belief, pork can be a healthy addition to your diet. It all comes down to how you cook it and what cuts of meat you choose. Three ounces of pork tenderloin have just 122 calories and 3 grams of fat. You'll also get 22.2 grams of protein, 46 percent of the RDA of selenium, 23 percent of the RDA of phosphorus and more than half of the daily recommended daily intake of thiamin. Lean pork is filling and nutritious and doesn't have more calories than poultry, chicken or fish. A 2014 clinical trial published in the journal Nutrients compared the effects of lean pork, chicken and fish on body composition. After three months, there were no differences in body weight, lean mass, waist/hip circumference and other markers of adiposity between the three groups. The study, however, involved the consumption of unprocessed meat. Bacon, hot dogs, sausages, salami and other processed meats have been linked to a 42 percent higher risk of coronary heart disease. These products are high in saturated fat, sodium and chemicals that affect heart function and overall health. Back in what has been called the "golden era of bodybuilding," athletes were drinking raw egg whites to get their dose of protein. Today, we have access to egg protein powder, liquid egg whites, pasteurized eggs and other similar products. The humble egg is chock-full of micronutrients and macronutrients that boost exercise performance and power up your diet. An extra large egg provides 80 calories, 7 grams of protein, 0.4 grams of carbs and 5.6 grams of fat. It's a good source of vitamin B12, riboflavin, choline, vitamin A and D, phosphorus, selenium and iron. As the Harvard School of Public Health notes, this superfood doesn't increase the risk of heart disease and high cholesterol in healthy individuals as was once thought. In fact, eggs might raise good cholesterol levels, according to a 2017 study published in The Journal of Nutrition. Subjects who consumed three eggs per day experienced an increase in HDL (good) cholesterol levels and large-LDL particle concentration. The study has also found that eating just one egg a day can trigger positive changes in blood lipids. A simple way to get more protein in your diet is to eat Greek yogurt between meals or use it in your favorite recipes. Depending on the brand, one cup has only 100 calories and contains over 17 grams of quality protein and 14 percent of the daily recommended calcium intake. With just 6.1 grams of carbs per serving, it fits into most diets. Rich in probiotics, Greek yogurt keeps your digestive system running smoothly and can positively alter the gut flora. In clinical trials, it has been shown to promote microbial diversity and increase Lactobacilli concentrations in the gut. Next time you're wondering what to eat, try quinoa salad, porridge or soup. This pseudo-grain goes well in most dishes, from stews and pilaf to casseroles. One cup boasts 222 calories, 8.1 grams of protein, 39.4 grams of carbs, 3.6 grams of fat and 5.2 grams of fiber. It's full of magnesium, copper, zinc, manganese, iron and phosphorus. Compared to other grains, quinoa has a lower glycemic index (50), so it's unlikely to cause blood sugar spikes. It's considered one of the best plant-based high-protein foods for vegans as it contains all nine essential amino acids. It also contains potent antioxidants and unsaturated fatty acids that promote optimal health. Read more: Is Quinoa a Complete Food? A 2017 clinical trial published in the journal Current Developments in Nutrition has found that eating as little as 50 grams of quinoa per day may lower triglyceride levels in overweight and obese individuals. Furthermore, this pseudo-grain is gluten-free, so it can be safely consumed by those with celiac disease. Packed with selenium, manganese, calcium and omega-3s, tofu can be a healthy addition to your daily meals. One cup provides 176.4 calories, 20.6 grams of protein, 4.2 grams of carbs, 10.6 grams of fat and 2.2 grams of fiber. This popular food is made from soybeans, which boast large doses of isoflavones and antioxidants. Its nutritional value depends on the preparation method used. As Today's Dietitian notes, the isoflavones in soy may protect against breast cancer and relieve menopause symptoms. Their health benefits are similar to those of estrogen. Furthermore, regular consumption of soy protein may reduce bad cholesterol levels by as much as 4.3 percent. Soy products, including tofu, have been subject to debate over the past decades. In 2017, the journal Nutrients published a review that explores isoflavones and their effects on human health. Scientists point out that most concerns surrounding these compounds are based on animal studies. Soy and its derivatives appear to be safe for all individuals except those who are allergic to it. Environmental Defense Fund: Mercury Alert: Is Canned Tuna Safe?